As we are in the midst of the 2014 midterm election season, many investors are wondering what potential impact these elections will have on the stock market. Based upon our review of historical data related to stock market performance and mid-term elections, we at Hennion & Walsh are optimistic that the midterm elections could provide another form of stimulus to this secular bull market. The first research study we reviewed in this regard was conducted by S&P Capital IQ. The study (summarized in the chart above) concluded that the stock market – which was defined in this study by the S&P 500 index – has gained 15.3% on average in the six months following a mid-term election in the 3rd year of a given term of a presidency, which is the case this year with President Obama – recognizing of course, that this is the second term of Obama’s presidency. The study also showed that the frequency of advance (“FoA”) for this occurrence was 94% of the overall time period of October 31, 1944 – September 29, 2014 for this research study. Midterm elections are currently scheduled for November 4, 2014, so this would roughly translate to the period of November 2014 – April 2015. Another area to observe as it relates to stock market performance following midterm elections (or presidential elections for that matter), is which political party is in control of Congress after the election. To this end, according to an MFS Investment Management research report entitled, “Primaries, caucuses, and elections…oh my!”, based on data from Ned Davis Research from 1900 – 2008, it appears that the combination of a Democrat President and a Republican Congress has produced the best historical returns from 1961-2010, on average, for the stock market – which was defined in this study by the S&P 500 index as well. Source: Washington Post, Election Lab, October 20, 2014. With several political analysts predicting that the Republicans will likely maintain their current majority in the House of Representatives and potentially win over a majority in the Senate (The Washington Post’s Election Lab is currently predicting the Republicans will flip seven Senate seats currently held by Democrats, while needing a flip of just six seats to take control of the Senate), this Democrat President (remembering that President Obama is a Democrat)/Republican Congress combination could be the result coming out of this midterm election cycle. Of course, it is important to note that this time around, the impact of the midterm elections on stock market results could be different and past performance does not guarantee future results. Source: MFS Investment Management. The Standard & Poor’s 500 Index (S&P 500) measures the broad U.S. stock market. Indexes are unmanaged, statistical composites and it is not possible to invest directly in an index. The returns shown do not reflect payment of any sales charges or fees an investor would pay to purchase the securities they represent. 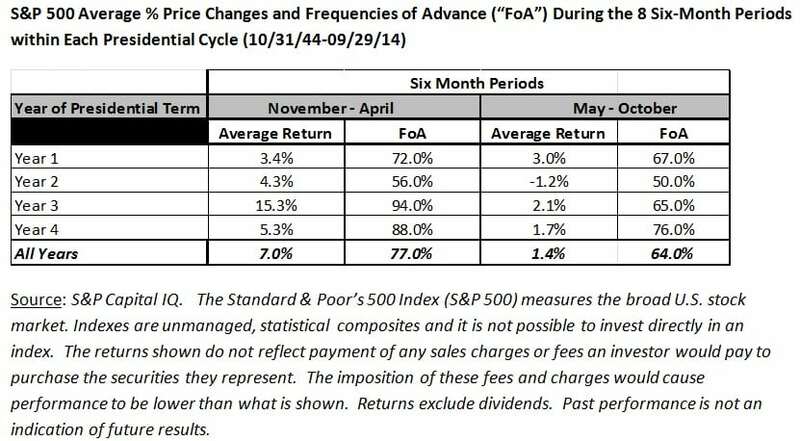 The imposition of these fees and charges would cause performance to be lower than what is shown. Past performance is not a guarantee of future results.